the last 5 videos viewed shows up in the left sidebar of your Channel page similar to the example at the left here taken from my own YouTube profile. Apparently you can also see who watched videos you uploaded if A) people watching your videos have Active Sharing turned on and B) people are actually watching the videos you upload. Mashable seems thrilled about this feature, although it only really gets interesting if everybody is doing it. Here's an example of what the who's watching portion of Active Sharing looks like. If you find someone with a great selection of uploaded videos, you can now sort by several options on their channel page, which is only marginally useful. For YouTube users with tons of friends, a new feature allows friend comments to auto-approve while non-friends can remain moderated. You can now unblock people who were previously blocked, so you can re-friend someone who ticked you off. You can see the full list of YouTube updates on the YouTube blog. 1) MySpace integration. 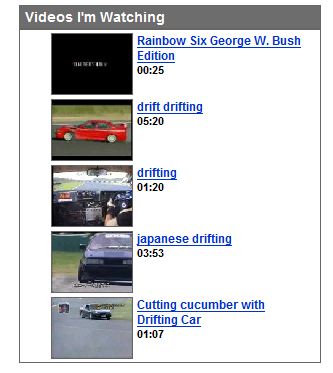 Google Video did this right. YouTube should steal the feature from Google Video and make it easy for anyone with a MySpace site to post a YouTube video. 2) Enable an Autostart feature for video sharing. The option exists, because I've documented how to autostart a YouTube video. YouTube should simply add this as an option when someone copies the embed code. 3) Enable a Loop feature for video sharing. Again, YouTube has this feature as an option, but they don't make it obvious. I previously documented how to loop a YouTube video, but YouTube should make this a feature people can toggle when they embed a video without needing to edit any code. 4) Disable audio option. The number one question I can't solve for YouTube users is how to disable the volume on an embedded video. People want to automatically start a YouTube video on their MySpace page or blog without having the audio so that they can also have a song embedded on their page. YouTube attempts to address this with AudioSwap, but this isn't what people are looking for. 5) Real Embedded Video Playlists. Again, YouTube almost gets there with the custom playlist option, but they don't go far enough. Not far behind the option to disable audio come requests from people who want to build a playlist of videos that play in order back-to-back. This would be easy for YouTube to do and would make multi-part videos more compelling for content creators. From a technology standpoint this is a piece of cake - Microsoft, Real and Apple have all done it for years on the server side.